This 2014 re-do of the Jane Austen classic is delightful. Emma Woodhouse is intelligent, rich, beautiful…and spoiled. The novel tracks her personal growth from self-absorbed to self-aware. Along the way, she develops empathy for the feelings of others, as her schemes to engineer happiness for others backfire. Will her new-found maturity also help her to find true love? 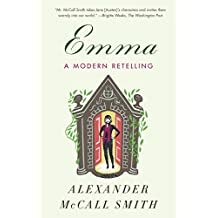 Alexander McCall Smith examines the world through the eyes of a wide cast of relatable characters, always treating them with humor and light irony, not bitter sarcasm. The novel is well-paced and interesting. An easy, yet rewarding read. I would definitely recommend this book.